← Cybercrime Prevention Act of 2012: Also Created To Fight Bloggers? “Here are the major political parties that had sprung up since 1986. Whatever did these parties stand for, really? How have these parties improved the lot of the poverty-stricken majority? How can parties be more inclusive, engaged with the people and not remain games that our political elite play? You will notice that political parties in the Philippines never break up over questions of policy or principle, but simply due to the personalities involved. UNIDO (United Nationalist Democratic Organization)was led by Salvador Laurel. It allied with PDP-Laban after its senior leaders persuaded Laurel to shelve his presidential ambition and run alongside Corazon Aquino in 1986. Unido died with Laurel. PDP-Laban – started as a coalition of Partido Demokratiko Pilipino of then Cagayan de Oro City Mayor Aquilino Pimentel Jr. and Laban (Lakas ng Bayan) of then former Senator Benigno Aquino Jr. in the 1980s. It fielded Corazon Aquino for president in 1986. Liberal Party – fielded Jovito Salonga for president in 1992. He lost. Fielded Senator Benigno Aquino III in 2010. He won. Nationalist People’s Coalition (NPC) – businessman Eduardo Cojuangco formed NPC in order to run in the 1992 presidential elections. He lost. He kept it on anyway because it proved to be a useful tool to protect his business interests. LDP – Laban ng Demokratikong Pilipino – was born out of a 1988 split in PDP-Laban between the Pimentel faction and the Jose “Peping” Cojuangco Jr. faction. It fielded Ramon Mitra Jr. as presidential candidate in 1992. Mitra lost. In 1998, it fielded Edgardo Angara as Joseph Estrada’s vice-presidential running mate. Angara lost. Partido Lakas ng Tao – Because LDP chose Mitra to be its presidential candidate iin 1992, Fidel Ramos bolted from LDP to form this party and run for president against Mitra in 1992. Ramos won. Puwersa ng Masang Pilipino (PMP) – Joseph Estrada used this to run for vice-president in 1992. He won. LAMMP – In 1998, Estrada’s PMP allied with Angara’s LDP to form LAMMP (Laban ng Makabayang Masang Pilipino). Estrada won but Angara lost. Lakas-Kampi – In 1998, Lakas fielded Jose de Venecia for president. Gloria Macapagal Arroyo and Vicente Sotto III both bolted LDP to form Kampi (Kabalikat ng Malayang Pilipino). Lakas allied with Kampi. Kampi – Mrs. Arroyo and Sotto (now a senator) formed Kampi in order to run for president and VP, respectively, in 1998. But the partnership was short-lived. Sotto’s involvement with an arrested drug lord surfaced and Arroyo slid down to be De Venecia’s running mate. Koalisyon ng Nagkakaisang Pilipino (KNP) – was formed from a core of LDP to back the candidacy of Fernando Poe Jr. in 2004. LDP, however, split up on this. One faction supported Poe while the other faction backed the presidential bid of Panfilo Lacson. Nacionalista Party – When Senator Manuel Villar bought the late Vice-President Salvador Laurel’s house, he negotiated the acquisition of the Nacionalista Party brand, too, from Laurel (The Unido had disintegrated and Laurel decided to simply revive the pre-Martial Law Nacionalista Party). Villar used the Nacionalist Party to be his campaign vehicle in 2010. He lost. UNO – United Opposition – is the alliance of Binay’s PDP-Laban and Estrada’s PMP for the 2010 elections. Estrada lost but Binay won. “What exactly is different between the various political parties? HAS any of you experienced being sick with “amoebiasis”, a chronic kind of diarrhea that can liquefy even when food ingested is hard and solid as steel. BUROROS is the local term. Are our politicians most virulent amoebas? Amoeba is unicellular. IT MULTIPLIES faster under light and darkness like cancerous cells. Ever wondered why Rizal’s Noli Me Tangere’s other title is SOCIAL CANCER? Our political system clearly is one of the huge factor why we see a lot of clowns in the government. Most of the political parties in our country are personality based instead of principle, platform based political parties. Their principal aim is to get a place but not to serve the best interest of the country. Its a high time that our country’s political party settings be changed. I heard that congress is proposing a bill rationalizing this. I hope this bill will not end up catering the selfish interest of our “pulitikos.” Do not wait for this bill – which you and I know will be self-serving. Let us use our vote next year to change the politicians’ behavior. I hope further that the “administration / opposition” settings in our congress will be eliminated. IMO this “administration / opposition” thing clearly shows how shallow our political system is, it is either you hate the administration because of reasons either personal, politcal, or “economical”. Regardless of how good the motive of administration, if you are in the opposition bloc per se, it is most likely there will be no support at all. Unlike when our “pulitikos” are being governed by their political platforms and principle, and it is known to the public, the unity for common good and interest of the country will be the foremost consideration. Why do politicians form political parties? – to pool together resources in order to gain promotional/campaign advantage, wider audience and sure supporters/voters (of course your party members and their friends, family, relatives, colleagues, etc.,are expected to vote for each member of the party). Joining a political party assures you of votes, irregardless of your qualifications or capability to serve efficiently and morally. Since our government is personality-based, why not abolish all political parties all together? Though forming allies by way of a political party is the best strategy to win an election, the people should be able to see through this misrepresentation. A politician should be judge individually, and solely from his or her own personal accomplishments and deeds, and not by how “glamorous” or how well “advertised” his political party is. If we continue to see political whores and entertainers in our government, then its either we got cheated once again, or majority of our people remain misinformed or starstrucked. When will this cycle of stupidity end? While I find the complaints legitimate, the sad thing is that under our current political set-up the only true “parties” are the political clans and families and their fractional alliances spread nationwide. 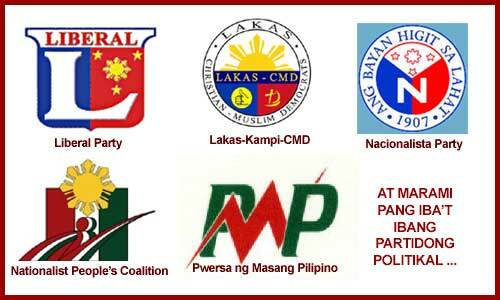 All these listed parties really are convenient aggrupations of political clans masquerading as a united political front. Political parties has nothing to do with the promotion of whores and entertainers in politics. The political animals and the traditional politicians within the parties are the ones responsible for it.